Who says the grill is only for meat?! This year-round recipe is sure to change the minds of even the biggest vegetable haters, but try it now while it's grilling season! I'm a firm believer in grill marks making everything taste better, and this recipe is no exception. For those of you who have had the pleasure of eating grilled vegetables, you know what a nice smoky char can do for pretty much anything. Although I had to use my George Foreman grill for these veggies, I can only imagine the difference a real charcoal grill would make. So grillers, get to grilling! 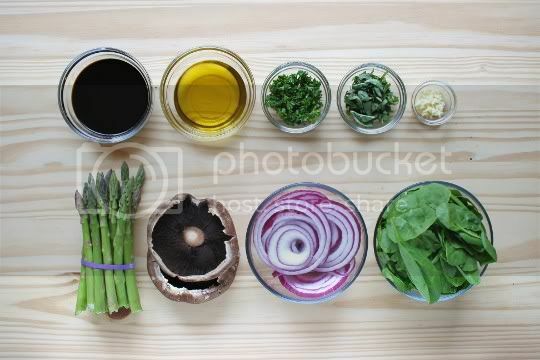 First, make a standard marinade by mixing balsamic vinegar, olive oil, fresh parsley and basil, and garlic. Marinate the veggies (portobellos, asparagus, and red onions) in this for about an hour at room temperature. Also, it's best to use the ziplock bag method to ensure all of the veggies are well coated. Also, you'll be reserving the marinade for later. Grill up the marinated veggies (George Foreman, grill pan, broiler, or actual grill), then chop them into bite-sized pieces when cool enough to handle. Pour the reserved marinade in a small pot, and bring to a boil. 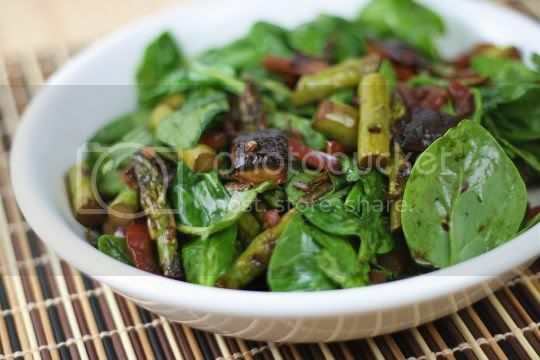 Add the veggies to a big bowl of fresh baby spinach, then pour the hot marinade over everything. Toss until well combined, season with freshly cracked black pepper and just a bit of sea salt, and serve. This is a great picnic or putluck dish (served warm or at room temperature), and it's best served alongside something "meaty" slathered in barbecue sauce, or even a side of grilled potatoes (yum!). The veggies are smoky and have a delicious roasted charred flavor, and if you grill them right, they'll have the perfect texture. 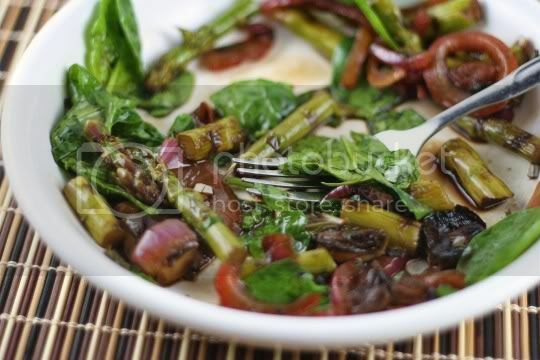 The asparagus is crunchy but tender, the onions are soft and sweet, and the portobellos are thick, juicy, and chewy. They even add a bit of a meaty grill flavor to the dish. The balsamic is strong, pungent, sweet, and tangy, and the parsley adds an herbal astringency that definitely packs a punch in addition to the marinade. Make again? Yes, and I'd like to try this recipe out on a REAL grill! Apartment living...blah LOL. Still, it's good to know that a grill pan or similar device can still make this tasty.